Nintendo has announced exactly what it will be doing at E3 2016, and we're going to be getting Zelda, followed by some Zelda, wrapped up nicely with a bit of Zelda. Apparently eschewing its usual Digital Event – and once again, a press conference – Nintendo will instead be hosting a live stream of The Legend of Zelda for Wii U. The stream will last the entire day, which is good news for anyone looking forward to the new Zelda game, but bad news for anyone hoping for other Nintendo goodies. 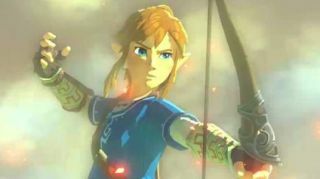 Last month, Nintendo stated that Zelda would be the only playable game at the show, so the announcement doesn't come as a surprise, although we were hoping for some new announcements. Nintendo of America president Reggie Fils-Aime will be introducing the Treehouse live stream, which kicks off 5pm GMT/9am PT on June 14. You'll be able to watch it on the dedicated site Nintendo has just launched. Last month Nintendo confirmed the new Zelda game will also launch on the still-mysterious NX. However, we'd be surprised if it chose E3 to reveal any footage from the next-gen version. For one thing, we're yet to see anything from the NX. But also, showing off an already-better version of a game not out until next year would be a bit of a kick in the teeth, wouldn't it?